You can empower and engage your students and help them succeed in and out of school. The key is focusing on what’s strong, not wrong. Use CliftonStrengths for Students access codes (formerly known as StrengthsQuest access codes) to help them succeed by discovering and developing what they naturally do best. Why use CliftonStrengths in higher education? College grads expect that their education will lead to a better life. But only one in 10 alumni are thriving in all five elements of their well-being. For students, living a great life starts when they discover and develop what they naturally do best. That's why more than 600 schools use CliftonStrengths for Students — to transform the way their students experience college and help them thrive on campus and beyond. Purchase CliftonStrengths for Students access codes and administer them to suit your needs. Subscribe to our premium solution and bring the power of CliftonStrengths development to all students, faculty and staff. 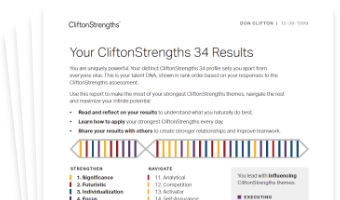 Students take the CliftonStrengths online assessment to uncover their natural talents. They use their personalized results to understand why they do what they do and how to do more of what they do best. Schools create curriculum and offer resources to help students succeed using their strengths. Campuses promote a culture that prioritizes strengths over weaknesses and builds teamwork through a focus on talents. Students learn to consider their strengths as they strive for great jobs and great lives. Schools offer students touch points throughout their time on campus to help them succeed before and after graduation. The best campuses use CliftonStrengths for Students. To help students thrive, you can use the new CliftonStrengths for Students access code (formerly known as the StrengthsQuest access code). Engage students with CliftonStrengths solutions for K‑12. Empowering and engaging students starts with surrounding them with teachers who help them discover and develop what they naturally do best. 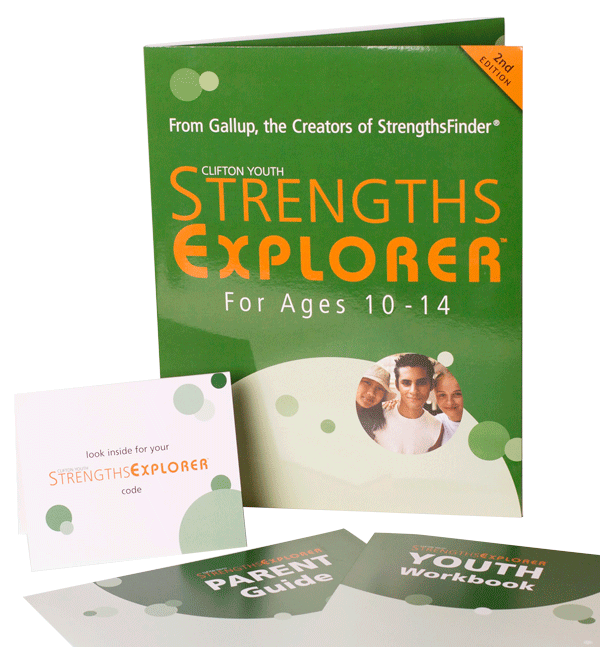 Gallup’s CliftonStrengths solutions help your school create engaging educational experiences for your students. Everyone has talent. And everyone has CliftonStrengths. When every student learns what’s unique and positive about themselves, they get an equal chance to apply their talents to succeed in and out of school. Student engagement in school decreases with each grade they pass. The confidence and guidance students gain from knowing their CliftonStrengths can help them remain engaged in school as they transition from grade to grade. What do you want to be when you grow up? It’s never too early for students to get a sense of how they’d answer. When they prep for careers and futures that fit their talents, it isn’t just the students who benefit. Entire communities experience transformational change. Schools create a dynamic, positive and engaged educational environment when every teacher and staff member has the chance to identify, understand and apply their natural talents. On-site CliftonStrengths coaches help teams collaborate more effectively. They lead teachers and staff to use their strengths in ways that benefit everyone in the school community. Once teachers and staff discover the power of CliftonStrengths development, they channel their efforts to empower students to do what they do best so they can succeed in academics and other aspects of school. 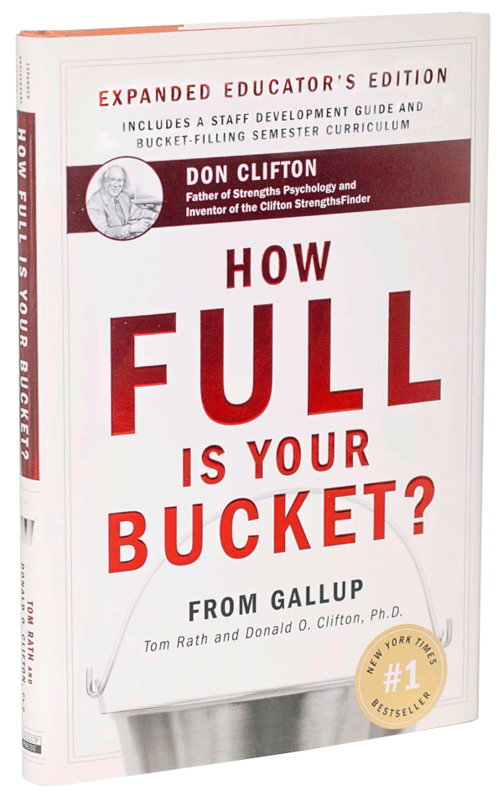 Gallup offers several CliftonStrengths products and services to help educators throughout the K-12 spectrum. Learn how great teachers use their strengths to inspire their students. Learn how to discover and develop your own — and your children’s — talents and strengths. Help high school students better transition to their next level of education. Learn how to use CliftonStrengths to improve your school. Complete this form, and a Gallup expert will contact you about how you can bring transformational change to your students and staff.